Continually changing air pressure improves circulation. 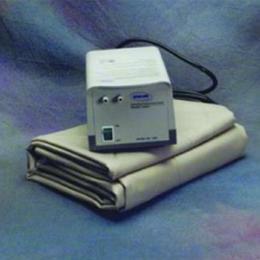 Model "D" pump with 8 gauge Medicare vinyl pad (11 columns, 2.5" inflated with flaps). 115V AC, 60 Hz; pressure fixed at 100 mmHg. Cycle time: 5 minutes. Unit is UL-listed, weighs 3 lbs. Includes 10' power cord. 1-year warranty on pump; 6-month on pad. 2-year warranty on pump. Measurements 8.5" x 4.25" x 3-5/8"